U.S. District Judge Lynn Adelman, the chief author of Wisconsin’s Open Records Law and a strong advocate of the Open Meetings Law, has been named the 2013 recipient of the Distinguished Wisconsin Watchdog Award. The award is a highlight of the third annual Wisconsin Watchdog Awards reception and dinner, presented jointly on Wednesday, April 24, by the Wisconsin Center for Investigative Journalism, the Wisconsin Freedom of Information Council and the Madison Pro Chapter of the Society of Professional Journalists. “The Open Records Law which Lynn Adelman introduced and worked hard to pass, and the Open Meetings Law he championed, are the bedrock documents of open government in Wisconsin,” said Bill Lueders, president of the Wisconsin Freedom of Information Council. Adelman was born in Milwaukee. He is a graduate of Princeton University and Columbia Law School. In 1977, Adelman was elected to the state Senate to represent the 28th District in southeastern Wisconsin. He held the position for 20 years. Adelman was the principal sponsor of the current version of the state’s Open Records Law, passed in 1981, and a major participant in a 1983 revision of the Open Meetings Law. 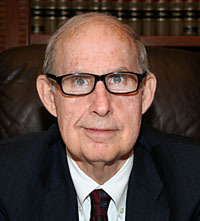 Adelman, 73, was appointed in 1997 by President Bill Clinton as a judge in U.S. District Court for the Eastern District of Wisconsin in Milwaukee. The Wisconsin Watchdog Awards, a celebration of investigative reporting and open government, also will feature a keynote address by Lea Thompson, an award-winning investigative journalist and University of Wisconsin-Madison graduate. Thompson, a Wisconsin native, was a chief correspondent at Dateline NBC for 16 years, and is known for her hard-hitting investigative pieces on consumer, health and safety issues. She now teaches investigative reporting around the world and produces documentaries. Also at the event, winners of the Wisconsin Freedom of Information Council’s annual Opee Awards will be recognized for their work promoting open government, and the Madison SPJ chapter will review the year in journalism. The event at the Madison Club, 5 E. Wilson St., is sponsored by the Wisconsin Newspaper Association, Wisconsin Broadcasters Association, Wisconsin State Journal, Milwaukee Journal Sentinel, WISC-TV and the law firm McGillivray Westerberg and Bender. Additional sponsors are being sought. Information is available here. The evening will begin with a reception at 5 p.m., followed by dinner at 6. Tickets are available for $55. Register online here. Attendance is limited to 120 and organizers expect all tickets will be sold.